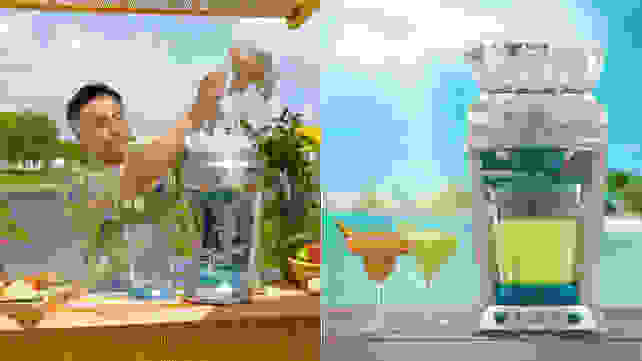 We tried the famous Margaritaville margarita maker—is it worth your money? If you're going to make margaritas, go all out. In classic New England fashion, spring arrived late and immediately turned up the temperatures to mid-summer levels. Now, I’m not complaining about the heat, because when it heats up, I like to turn up with a frozen cocktail or three. So, with Cinco de Mayo right around the corner and summer not far behind that, it’s time for me to break out one of the most ridiculous but rewarding things I own. I’m talking about my Margaritaville Frozen Concoction Maker, which makes pitcher after pitcher of amazingly perfect frozen drinks. This thing is heavy, huge, somewhat pricey, and kind of a one-trick pony. But it’s an absolute all-star when it comes to that one trick: making delicious summer cocktails. No, that's not my brother, but he does have a tiki bar in his backyard! When I turned 21, my family threw a big backyard BBQ (perks of being a summer baby), and my stepbrother rolled up with a big bottle of tequila wrapped with an even bigger bow. “Cool,” I thought, “We can take shots!” But then he unloaded this massive box from the back of his truck and hauled it into the kitchen. It was his brand new Margaritaville—and it was amazing. He whipped up pitcher after pitcher of frozen margaritas that were so icy and refreshing (and yes, we took shots too). This was in 2008, and I’m fairly certain the blender has just been released. We’re a fairly party-friendly family, if you haven’t guessed that yet, so it came as no surprise that my stepbro had no qualms about making the investment. Flash forward 10 years and I managed to get my hands on, ironically, the 10-year anniversary edition ($349.99 on Amazon). Jimmy Buffet knows what's truly important in a dire situation: Save the margs! What really sets the Margaritaville apart from your everyday blender is the top-loading ice reservoir. Rather than pulverizing ice cubes into itty bitty pieces, the top-loader has a long, super sharp blade and a mechanism that churns the ice, shaving it into an almost snowcone-like consistency that collects in the waiting pitcher. Plus, on the Key West models at least, it can hold enough ice to make three pitchers’ worth of drinks. Salt or no salt, it's hard to deny how perfect the margarita truly is. If you watch the video at the top of this page, you can see us pit my Margaritaville up against one of our favorite professional blenders to see if there really was a difference. And it turns out that the shaved ice approach melts much more slowly than pulverized ice, resulting in a more consistently awesome drinking experience. I love my Margaritaville, but even I was skeptical about that and was pretty surprised by the results. To make a batch of cocktails or mocktails in this beast, it's as easy as using a regular blender—maybe even a little easier. The Margaritaville is designed so you can easily maneuver the pitcher in and out of its place without spilling. It also comes with a book of recipe ideas to get you started, which is great for deciding the right ratios whether you’re making margs, pina coladas, mudslides (yep, it does those too), or your own concoction. The automated controls know exactly how long to blend to reach frozen drink nirvana. So, when you are ready to make your drink, this is where it gets kinda cool and deviates from the traditional blender concept. With a regular blender, you generally have to turn it on, wait, and turn it back off again, which means timing is everything to get the right consistency. But with the Margaritaville, the whole process is automated. You choose how many drinks you’re making (one, two, or three 12-ounce servings), turn it on, and then flick a switch. It shaves the exact right amount of ice from the hopper and is all on a timer to make sure the results are just right. There’s even a little row of shark fins that light up one by one so you know how close you are to your happy hour. Once there’s enough ice in the pitcher, the blender starts to combine the liquid with the pile of ice sitting on top. In under two minutes (I think. I haven’t timed it with a stopwatch), you’ve got a pitcher of the perfect margaritas. And if you maybe added too much or not enough (yeah right) of your booze and mixer, you can add more of whatever you need thanks to a switch that manually shaves more ice or blends your concoction. 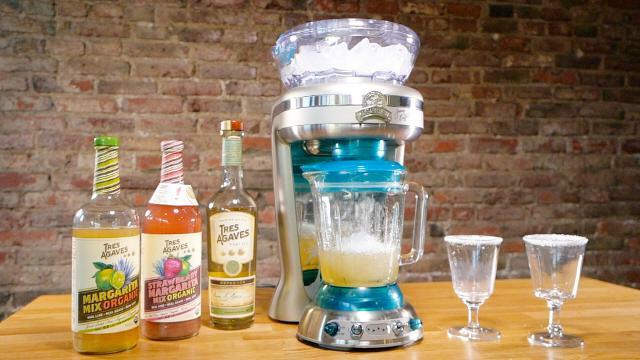 The Margaritaville can whip up any frozen cocktail recipe you're craving. As much as I enjoyed the end result, there are a few quirks and design issues that stop me from saying this is a must-have for frozen drink lovers. There's only one ice setting (shaved) and the pitcher can sometimes leak a bit, which is definitely not ideal. I have a small kitchen with limited storage space, so my biggest concern was where to keep this beast of a machine. It’s really not something you’ll want to keep on your counter 24/7 (unless you’ve got a dedicated bar in your home), and it weighs anywhere from 22-24 pounds depending on the model. I'm forced to keep it on a shelf in plain view, which only adds to the overcrowded vibe of my tiny third-floor apartment kitchen. Cleaning is also a bit of a hassle. There are a lot of parts, not to mention the insanely sharp blades in the ice hopper and the pitcher. And they all come apart, so while most everything is dishwasher-safe you still have to disassemble and reassemble it every time you clean it. The ice reservoir, however, is really easy to empty. You literally just shave all the ice into the pitcher, dump it out, and let it air dry. But despite those setbacks, on the days I crave margaritas, it's all so worth it. Honestly, this is such a loaded question because it really depends on your lifestyle. 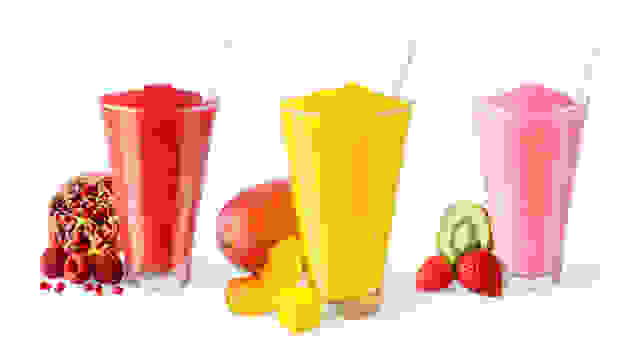 If you enjoy the occasional frozen cocktail (or mocktail), a regular blender is probably more than fine to satisfy your cravings. 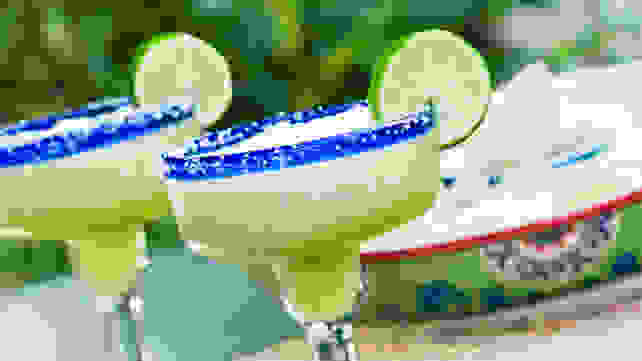 But if you host parties and get-togethers on the regular, live somewhere where it’s perpetually warm, have extra counter or storage space, or consider margaritas—and frozen drinks in general—to be your go-to drink of choice… Honestly, why not? It’s hard to get a better frozen blended drink without going out on the town.